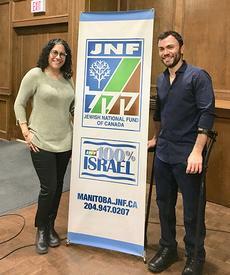 Noam Gershony received a standing ovation from the large audience that came to hear him share his inspiring personal story at an event put on by the Jewish National Fund on November 7. Noam Gershony is lucky to be alive. 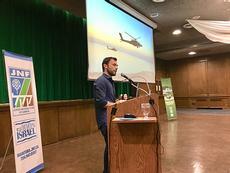 A former combat pilot in the Israeli Air Force, Gershony was critically wounded in the second Lebanon war in an Apache helicopter crash in 2006. His rehabilitation process was considered a medical miracle.During his rehabilitation process,Noam began to practice tennis at Beit Halochem and became a leading tennis player in Israel’s national team for the handicapped. Among other achievements in the field he won his gold medal in Quad Singles and shared a bronze in Quad Doubles with Shraga Weinberg in the 2012 London Paralympic Games. In wheelchair tennis he is rated second in the world in the highest rank of disability. Growing up Gershony loved to play tennis, ski and skydive. 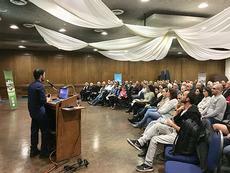 Although today Gershony is in a wheelchair much of the time, he used two canes to enable him to walk up to the podium at Shaarey Zedek and he stood throughout his moving and inspiring presentation.He told the audience that while his right leg is functional, his left leg is not. He has a brace on his left leg that enables him to walk a little bit. “I was raised in a strong Zionist family,” he said. He never thought he would be a pilot but when "I made it through flight school, my mom cried for three days." Gershony noted "they put metal everywhere in my body." He spent six months in the hospital. Because of his broken jaw, he couldn't eat. He had to sip protein drinks such as Ensure through a straw for two and a half months . "I was so weak."